“East/ West Pyre for Mihai” was built as a meditation on the life of a friend and mentor using the unrelenting conditions of the desert as a vehicle for the work's slow demise and the inevitability of life's failure. The work had three stages: conception, construction and failure. This drawing indicated exactly where the structure of the work failed due to weight, heat and wind. 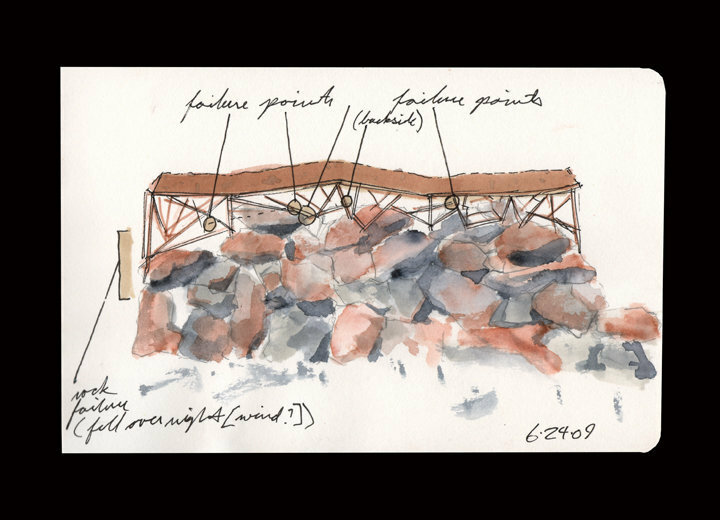 In the end, the work was built to fail; any and all metaphors are welcomed pencil, pen and wash on paper 5" x 6.5"